As co-hosts of FFRF’s radio show and podcast, Freethought Radio, Dan Barker and I recently held a drawing to give away five signed copies of The Trouble with God, a new irreverent book by screenwriter Chris (“Bill and Ted’s Excellent Adventure”) Matheson. Chris, an atheist and entertaining guy who’s been a recent guest on Freethought Radio, generously sent the autographed copies to hand out, and we had lots of interest. Our podcast statistics last year revealed that we had listeners from every European country except Estonia, all Latin American countries except Suriname and French Guiana, 21 African nations, Australia, New Zealand, Indonesia and pretty much all East and Southeast Asian countries (with the obvious exception of North Korea). 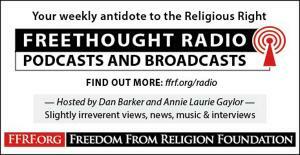 More than 192 podcast agents are being used to access Freethought Radio. Wow! 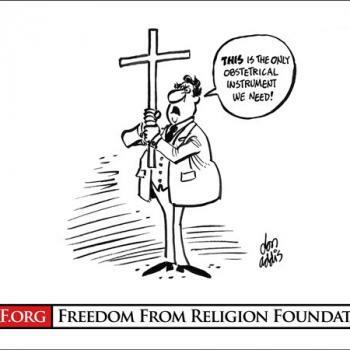 Freethought is global. Thank you, podcast and broadcast listeners. You give us hope. 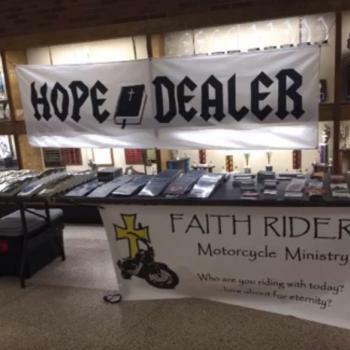 Please plan to join us regularly for more rational radio and blasphemous broadcasting. How to Listen: Freethought Radio is available as a podcast Thursday afternoons, as well as being broadcast in Madison and Janesville, Wis., Columbia, Mo., College Station, Texas, Ithaca and Watkins Glen, N.Y., and Vermont/New Hampshire. 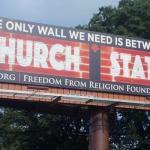 This week’s podcast ADD LINK features veteran author, journalist and observer Susan Jacoby talking about her recent column in The New York Times, “The White House is Tearing Down the Wall Between Church and State,” along with commentary on timely news developments as well as FFRF actions. Last week, we spoke with Nation columnist, atheist and feminist touchstone Katha Pollitt, particularly about new perils to reproductive rights. 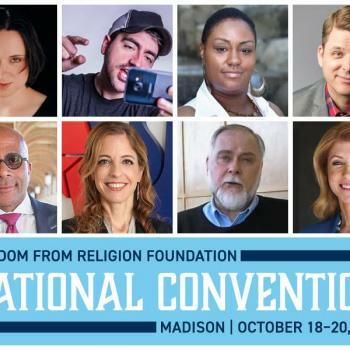 Look for the inside scoop on FFRF’s timely actions, and many fascinating guests and experts in coming weeks — to help all of us fight back against the Kavanaugh nomination and the attempted takeover of our government by the Religious Right (balanced, of course, with some light entertainment and music to soothe besieged seculars). "Science dose not require that it explains everything or claims to explain everything. If there ..."
“This house does not believe in ..."
"I'm not going to accept your musings as science until you have peer-reviewed, testable and ..."
"I'm well aware how science operates - you don't have to teach me. I'm pointing ..."
"Science deals primarily with things that can be observed and measured in some way. 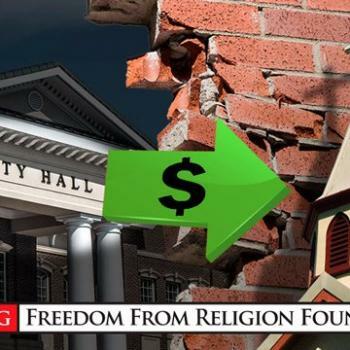 If ..."
Related posts from Freethought Now!